The ‘Bell Labs Digital Synthesiser’ or ‘Hal Alles Synthesiser’ was one of the first ‘real-time’ digital instrument – as opposed to a non-real time digital/analogue hybrid performance such as the GROOVE system. The instrument was the result of Alles’ experiments with digital filters and tone generators for telephonic applications at Bell Labs (Murray Hills, New Jersey, USA) during the mid 1970’s. Max Mathews – creator at Bell Labs of the MUSIC X series of computer synthesis languages – witnessed one of these demonstrations and excitedly encouraged Alles to develop the a musical instrument using purely digital technology. With no background in music technology, Alles, inspired and intrigued by Robert Moog’s recent instruments and Carlos’s ‘Switched on Bach’ began to assemble the new digital synthesiser in the mid-1970’s; a ‘fragile laboratory one-off of questionable reliability’. 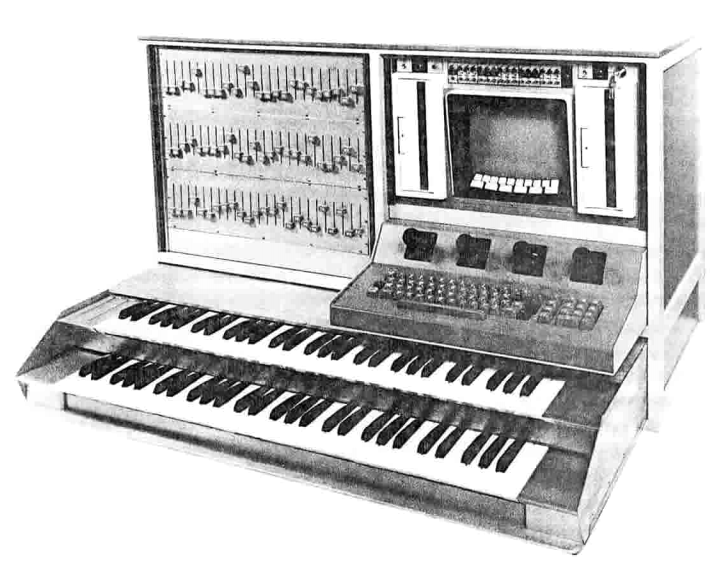 However, Once completed, the Alles Synthesizer project was sidelined in favour of more business oriented research and was little used apart from internal presentations. This changed in 1977 when Bell Labs and AT&T used the instrument as the centerpiece for the Motion Picture Academy’s 50th anniversary celebration of talking pictures. Despite a renewed interest from the music industry, Alles moved to other fields of research at Bell labs, Max Mathews worked with the machine for a while and in 1981 it was donated to Oberlin College Conservatory TIMARA department where it has recently been rebuilt using modern components. Alles’s instrument had significant but quiet influence on the development of electronic instruments, most notably the Italian company Crumar’s high-end GDS ‘General Development System’ which was essentially a commercially repackaged version of the Alles Synthesiser released in 1980 . The GDS was a 16-bit digital synthesizer with 32 oscillators offering a mix of both additive and FM/Phase Distortion synthesis and consisted of the sound generator and keyboard unit controlled by a Z-80-microcomputer. With a hefty price tag of around $30,000, the GDS was intended as a general music production system for recording studios giving consistent and real time performance capabilities far beyond the rather erratic analog synthesisers of the day. Wendy Carlos was an early (and current) champion of the GDS. Wendy Carlos. A soundtrack example of the Crumar GDS on the theme from ‘Tron’ 1982. As the components used in the prototype eventually became cheaper, more cost effective versions were produced such as the DKI (Crumar again) Synergy, released in 1981 for around $5,300, this instrument disposed of the external computer in favour of a much simplified push-button interface (or an optional Kaypro 2 computer) and housed the entire instrument in a more conventional keyboard housing. In 1981 Ceasar Castro and Alan Heaberland produced their Casheab S-100 system clearly influenced by the Alles Synthesiser design. The Japanese computer company Atari initiated the Sierra Project; a 64 oscillator single chip version of the Alles synthesiser intended for games effects and music – known as the AMY1 chip it never saw the light of day due to legal difficulties. Ultimately all of these early digital additive/FM instruments and projects were rendered obsolete by the arrival of Yamaha’s affordable digital DX7 FM Synthesiser in 1983. Production of the Synergy finished in 1985 – though a rack mounted MIDI version (by Mercer Stockell, Jim Wright and Jerry Ptascynski) called the Mulogix Slave 32 was produced until 1989.